Rise Against’s trips to the UK seem to have followed a three-year cycle for some time now, and the Apollo has been their go-to Manchester venue for just as long. They’ve far from plateaued, though, with a new album release earlier this year and minimal tickets left. Plus, judging by reactions before doors, people are hungry for tonight’s show. Walking into the Apollo to be greeted with the shouty, sweaty madness of Pears (7) is definitely something of a contrast to the barren, chilly streets outside, but it’s a more than welcome one. Singer Zach Quinn is impossible to divert your eyes from. He’s constantly moving, almost like he’s hooked up to a shock machine, brandishing the microphone stand like a trophy and even breaking into what looks like his own spin on the Macarena at one point. If Quinn is the human representative of the more abrasive side of Pears, Brian Pretus is their friendlier face, engaging in banter with the crowd, remaining jovial throughout even though his attempts aren’t reciprocated massively. While the general chaos on Quinn’s part is utter brilliance visually, his vocals do teeter into incoherence at points, which is particularly jarring on their (many) shorter songs. But as an introduction to Pears (which for most people this is), it definitely succeeds in leaving an impression on the Apollo crowd. 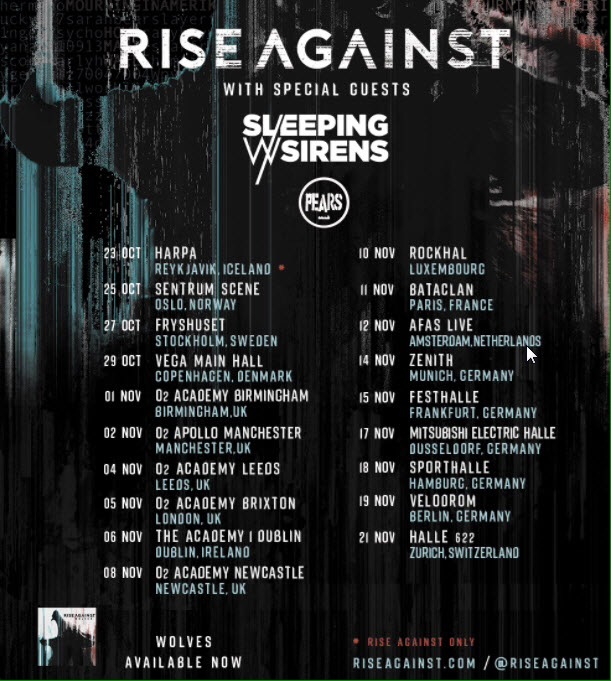 The announcement of Sleeping With Sirens (8) as this tour’s main support undoubtedly raised a few eyebrows, and there’s a noticeable split in the crowd of those whose allegiances lie with Kellin Quinn and co, and those who probably couldn’t think of anything worse. As their set gets into full swing though, the reaction is largely positive (apart from a tiny group of drunk punters booing), and it’s easy to see why. When his voice really kicks in to singing soaring high notes, Quinn is truly a force to be reckoned with (admittedly, his lower octaves are shaky, but there aren’t many times we’re exposed to that side of his range). And whether solely down to the lack of shiny production to gloss over their songs, or whether it’s been consciously done to fit in more with their tourmates, the instrumentation, especially in Empire To Ashes and Congratulations is impressively (and probably surprisingly to a lot of people here) beefed up. People are genuinely enjoying themselves, so it’s a huge shame when Sleeping With Sirens’ sound completely cuts out during If You Can’t Hang, resulting in them dejectedly having to leave the stage with ten minutes of their set left. Regardless of prior opinion, there’s a shared sense of disappointment in the room for what seems like an unfair end to their show, but soon enough everything is fixed and the five-piece return for a triumphant Kick Me, easily the highlight of their time onstage, and a happy ending for their rollercoaster of a set. As screens on each side of the Apollo stage light up and house lights go down, one of the most important rock bands of recent times are met with what can only be described as pure adoration (as said before, these fans are hungry). Of course, it’s Rise Against (9), and as the rest of his band take their places onstage, frontman Tim McIlrath wastes no time getting into his role, thundering around the space left leading the crowd in a chant of “rise”. Fists are in the air, and McIlrath revels in being every inch the passionate incendiary he is on record as Chamber The Cartridge furiously kicks in. Because of his guitarist duties, these times where he commands the crowd from every inch of the stage he can are rare, but when he does it’s truly magic. The choice of songs from the Rise Against repertoire aired tonight are a brilliant mix, from the big singles to deeper cuts like Bricks and Dancing For Rain. The Violence, Wolves and House On Fire from new record Wolves slot in seamlessly with older cuts, even if they’re met with an understandably less positive reaction than old favourites. In terms of voicing the opinions this band hold so strongly, the songs are mostly the medium – Rise Against are merely the vessel. It’s heartening seeing the entire venue belting out songs like Prayer Of The Refugee and Help Is On The Way, tracks with such open and important messages, and the army of voices repeating their words makes it clear the scale of how far those messages are spreading. Rise Against’s acoustic songs make up some of the most meaningful in their discography, and the mid-set block of three is easily the most poignant part of the evening. People Live Here, Swing Life Away and especially Hero Of War all hit home immensely, again helped by the unfaltering echo of voices surrounding McIlrath’s. The only time the topics that fuel their songs spill into between-song talk is before Make It Stop (September’s Children), the first song of the encore, where an impassioned speech about the injustices and terror many gay people face, especially in America, unites everyone in the room, fans and band alike. This encore, completed by the brilliant Savior, hammers home everything that’s been great about tonight (and a Rise Against show in general). People here are losing their minds and ferociously pitting like there’s no tomorrow, but there’s nothing present but absolute elation at the hands of the atmosphere and passion and unity at the hands of the music. It’s the reaction Rise Against songs should inspire, and seeing that in action tonight not only confirms their status in the rock world, but just how deserving they are of it.